In order to achieve the highest level of customer satisfaction, Megaplaza kindly provides the Apply Filter Button as the extra feature for Magento 2 Layered Navigation extension. By enabling this feature, an Apply Filter button will be displayed at the bottom of the Layered Navigation section. When choosing multi-filters, the shoppers now no longer need to see the page is auto-load again and again each time they choose a filter. Without waiting for the loading page, of course, the shoppers will save much time in finding their desired items. Time is gold. The much time you save, the better experience the shoppers feel. As a result, you will have more chances to change a visitor into a loyal customer of your store. The conversion rate is the key to the success of any e-commerce site. With the higher conversion rate, the shoppers are more likely to make a purchase or return the site again. Using the Apply Filter button for the Layered Navigation is a great way to increase this rate and boost the sales. It is may just a small modification but will definitely make a huge positive result. It’s as easy as pie to enable the Apply Filter button on the Megaplaza Layered Navigation configuration. Go to Admin Panel > Mageplaza > Layered Navigation > Configuration > General tab. 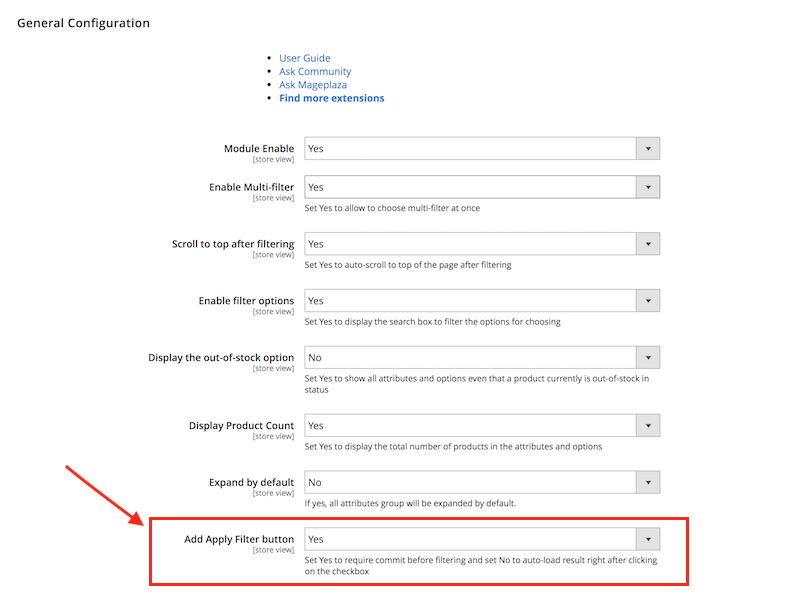 In the Add Apply Filter Button field, you can set Yes to require commit before filtering and set No to auto-load result right after clicking on the checkbox. Click Save Config and see the result.